Tilak is a Scientist at TRI and leads the Home and Community Team. He completed his PhD in Mechanical Engineering in 2012 at the University of Toronto focused on preventing back injury in caregivers (Two resulting papers can be found here.) The video below is targeted at caregivers to give them a better understanding of how back injuries happen and how they can prevent them in their day-to-day work. This work as included developing new materials for training healthcare workers and new equipment for making their work safer such as SlingSerter. His past work includes studies of scooter maneuverability to make recommendations for changes to building codes as well as the design of anti-collision systems for power wheelchairs to give more wheelchair users greater independence. More recently, Tilak has also turned his attention to footwear slip-resistance testing on ice and snow. His goal is to provide consumers with ratings that define how well the footwear works on snow and ice so that we can all make more informed purchases. 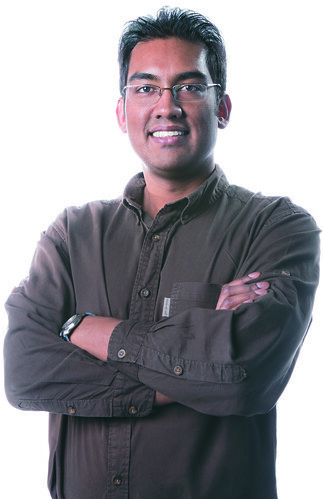 Finally, Tilak wants to change the way engineering design is taught to students. Design requires testing out ideas to see if they will work and to keep trying when they do not. Typical courses don’t give students enough time to test iterations of prototypes. Tilak incorporates design within students’ graduate projects. SlingSerter – King EC, Sobchak AM, Griggs GT, Fernie GR, Wilcox PJ, and Dutta T. Lifting Assist Device. US Patent 8,403,299 B2 Filed Jan 26 2012, published Jul 19 2012, granted/issued Mar 26, 2013. RoboNurse – Fernie GR, Sobchak AM, Dutta T, Smyth TD, Chin C. Patient Lift and Positioning System, and Adjustable Components Thereof. US Patent Application No. US61/728,689 filed 20 November 2012. Anti-collision wheelchair – Griggs GT, Dutta T and Fernie GR. Powered wheelchair. US provisional application, filed 9 September 2008; US patent application #12/585,250, filed 9 September 2009. SlingSerter – King EC, Sobchak AM, Griggs GT, Dutta T, Fernie GR and Wilcox PJ. Lifting Assist Device. US provisional patent application #60/924,318 filed 9 May, 2007; PCT patent application #CA2008/000929 and US patent application #12/149,845, filed 8 May 2008. Ford, Daniel; Ortega, Theodoce; Kajaks, Tara; Longfield, Amanda, Dutta T, 2016. PostureCoach: A pilot study of a wearable,real-time posture coaching system. Applied Ergonomics. Submitted. Anwer A, Bagheri ZS, Fernie G, Dutta T, Naguib HE. (2016). Evolution of the Coefficient of Friction with Surface Wear for Advanced Surface Textured Composites. Advanced Materials Interfaces. Submitted. Semple M, Kajaks T, Orozco F, Prout EC, Dutta T, 2016. PostureCoach: Validation of a wearable movement-basedfeedback system for reducing risk of back injury. Applied Ergonomics. Submitted. Eftekhar P, Mochizuki G, Dutta T, Richardson D, Brooks D, 2016. Goal Attainment Scaling in Individuals with Upper Limb Spasticity Post Stroke. Occupational Therapy International. In Press. Eftekhar P, Li MH, Semple MJ, Richardson D, Brooks D, Mochizuki G, Dutta T, 2016. Implementation of kinematic upper-limb spasticity assessment (KUSA): a case series. Disability and Rehabilitation. Submitted. King E, Callaghan J, Boscart, Weiss B, Dutta T, Fernie G, 2016. Assisting frail seniors with toileting in a home bathroom: Approaches used by home care providers. Journal of Applied Gerontology. Revision Requested. Hsu J, Li Y, Dutta T, and Fernie G, 2015. Maximum achievable inclines for footwear while walking on icy slopes and cross-slopes. Applied Ergonomics, 50: 218-225. Rizvi R, Naguib H, Fernie G and Dutta T, 2015. High friction on ice provided by elastomeric fiber composites with textured surfaces. Appied Physics Letters, 106(11): 11-16. Dutta T, Fernie GR, 2014. Outcomes rather than outputs: Collaborative closed-loop design and commercialization. Technology Transfer and Entrepreneurship, 1(1): 9-14. Hsu J, Shaw R, Li Y, Novak A, Dutta T, Ormerod M, Newton R, and Fernie G, 2014. Slip resistance of winter footwear on snow and ice measured using maximum achievable incline. Ergonomics, in-press. Hsu J, Li Y, Dutta T, and Fernie G. 2014. Comparison of footwear slip resistance measurement parameters to gait on icy surfaces. Industrial Health, submitted. Hsu J, Denbeigh K, Li Y, Dutta T, and Geoff Fernie, 2014. Footwear and anti-slip device testing in simulated winter conditions, Industrial Ergonomics, submitted. Vena D, Novak A, Dutta T, King E, Fernie G, 2015. The evaluation of vertical pole configuration and location on assisting the sit-to-stand movement in older adults with mobility limitations. Assistive Technology, in press. Dutta T, Holliday, PJ, Gorski SM, Baharvandy MS, Fernie GR, 2014. A biomechanical assessment of sling insertion using one or two caregivers for patient transfers. Applied Ergonomics, accepted with minor revsions. Dutta T, 2014. Spine shrinkage and cumulative load during sitting and standing. Theoretical Issues in Ergonomics Science, 15 (6) pp. 636-646. Dutta T, 2012. Evaluation of the KinectTM sensor for 3-D kinematic measurement in the workplace. Applied Ergonomics, 43, 645-649. Dutta T, Holliday, PJ, Gorski SM, Baharvandy MS, Fernie GR, 2012. A biomechanical assessment of floor and overhead lifts using one or two caregivers for patient transfers. Applied Ergonomics, 43, 521-531. Dutta T, Holliday PJ, Gorski SM, Baharvandy MS, Fernie GR, 2011. The effects of caregiver experience on low back loads during floor and overhead lift maneuvering activities. International Journal of Industrial Ergonomics 41, 653-660. King EC, Dutta T, Gorski SM, Holliday PJ, Fernie GR, 2011. Design of Built Environments to Accommodate Mobility Scooter Users: Part II. Disability and Rehabilitation: Assistive Technology 6(5), 432-439. Wang RH, Mihailidis A, Dutta T, Fernie GR. 2011. Usability testing of a multimodal feedback interface on a simulated collision-avoidance power wheelchair for long-term care home residents with cognitive impairments. Journal of Rehabilitation Research and Development. 48(6), 801-822. Dutta, T, King EC, Holliday PJ, Gorski SM, and Fernie GR. 2011. Design of Built Environments to Accommodate Mobility Scooter Users: Part I. Disability and Rehabilitation: Assistive Technology. 6(1), 67-76. Dutta T, Fernie GR, 2005. Utilization of ultrasound sensors for anti-collision systems of powered wheelchairs, IEEE Transactions on Neural Systems and Rehabilitation Engineering. 13(1), 24-32.